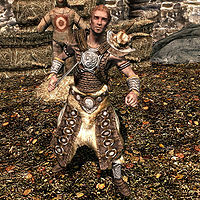 Harrald, a Nord warrior, is the son of Jarl Laila Law-Giver and brother to Saerlund. He lives in Mistveil Keep in Riften. He gets up at 8am and has a two-hour breakfast, then wanders around inside Mistveil Keep. At noon, he goes outside to the courtyard and practices his swordsmanship against a training dummy. He stops at 7pm to have dinner at the keep for two hours, going outside again at 9pm to watch the guards practice. He returns to Mistveil Keep at midnight for bedtime. Harrald wears a set of scaled horn armor with matching pairs of bracers and boots. He is equipped with a leveled dagger which can be up to elven quality, and carries a belted tunic along with a selection of upper-class loot and gold. Unlike his brother, Saerlund, he is a staunch Stormcloak supporter and is unafraid to show it; because Saerlund spoke out in favor of the Empire, Harrald disowned him as his brother and shows hostility towards him. Harrald has gone as far as admitting that if he was jarl, he would have had Saerlund executed for treason. Harrald is also known to be very arrogant and dislike some outside visitors to Mistveil Keep. He even goes to the point of asking you to retrieve his sword from the local blacksmith, Balimund, who assures you that Harrald is too full of himself to get the sword. Should you try to talk with him, Harrald will have little interest and will quickly tell you, "Out of my way. The son of the Jarl has no time for idle conversation with travelers." He will then continue to express his lack of interest in conversation: "If this isn't about official city business, you're wasting my time." He may also assume you have business to discuss with him: "I presume you have something important to say?" Mention to him that he only has a dagger for the son of the jarl and he'll reply, "If you must know, I was practicing in the yard when the guard I was sparring with feinted when I specifically told him to duck! My blade bit right into the stonework next to the keep and needed serious repairs. Thankfully our smith Balimund works wonders." He will continue, "In fact, if you'd fetch my blade from him I'd be most appreciative." Declining will have him say, "Hmph. I should have known better than to ask a knave." If you accept, he will be grateful: "Thank you. Do hurry please." Go to Balimund and tell him that you're here for Harrald's sword. He will remark, "Lazy good-for-nothing, isn't he? Sent you down here when I'm a stone's throw from the keep? Here's the sword. Tell Harrald to stop slaying walls and perhaps his blade will stay in better condition!" Give the sword to Harrald, who will say, "Took your sweet time getting it to me. Here you go, for your trouble." He will reward you with two leveled gems. You can ask Harrald why he does not like visitors at Mistveil Keep, and he will tell you, "Every day the threat of exile from Riften draws closer for myself and my family. Who knows how many spies the Empire has sent into our midst already. We're at war. This isn't the time for hospitality. Thank goodness mother is keeping a level head about everything. If my brother Saerlund had his way, we'd be flying Imperial colors by now." You can also ask him about how he and his brother don't see eye to eye, and he will then explain their differing views on the Empire: "Can you believe that fool had the audacity to speak of his love for the Empire in the plaza? He expects us to drop our defenses and greet them with open arms... to dialogue with them rather than defend our homeland by spilling their blood. He's a traitor, plain and simple. Had I been sitting on the throne, he'd be hanging from the gallows for his sympathies towards the Empire." Saerlund: "Come now brother, don't act all high and mighty. I know you could care less about the war one way or another. The things you say are just an act to please mother." Harrald: "Perhaps. Perhaps not. I'm disappointed in you brother. You had it all. You had it all and your mouth cost you everything." Saerlund: "At least I've chosen a side instead of acting like a spectator. One day, you'll be forced to make a choice. And I hope it's the right one, brother." Saerlund: "What's become of us? We used to be inseparable... always fighting back to back and letting nothing stand in our way. You've changed, brother. And not for the better I'm afraid." Saerlund: "You've done what you've had to for yourself, not for mother. Wise up, Harrald. There's a storm on the horizon and it will blow through here with all its fury. It's time to choose a side." 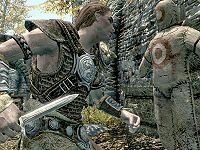 Despite being labeled as a Stormcloak supporter, if Riften is under the control of the Imperial Legion, he will not leave and his dialogue does not change. This page was last modified on 5 November 2018, at 04:25.